So, I was having some odd dreams last night...mostly consisting of the typical, I'm back in High School and I can't remember my locker combination or which classes I have, etc. But then, I had a dream that I was at work and my coworkers went and got KFC and they ate it in front of me! I was not a happy camper. Honestly, I haven't even thought about KFC in ages, but this dream really had me wanting some fried chicken, so what was I to do? 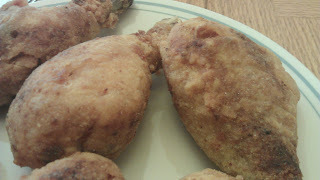 I fried me up some chicken! Remove the skins from the chicken (unless of course, you like the skin, I don't, so I skin them). Combine the milk and the eggs in a large bowl or baking dish and add the chicken. Allow to sit in the mixture for ~30 minutes. While the chicken is resting in the milk. Combine the spices in a small bowl and set aside. Place the flour in a shallow baking dish and set aside. Add canola oil to a deep, heavy Dutch oven to reach 1 1/2 inches. Heat the oil to 350F. 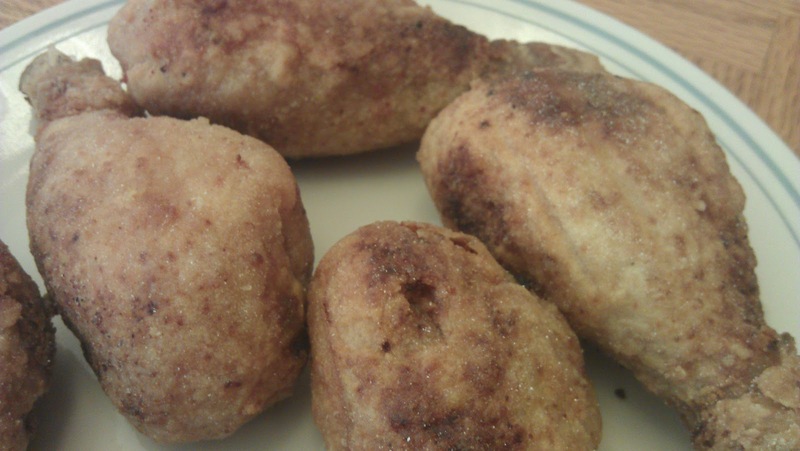 While the oil is heating, remove the chicken from the milk and dredge with flour. Dip the chicken again in the milk, then liberally season with the spice mixture and follow that with another dredging in the flour. Add the chicken to the hot oil. The oil temperature will drop, when you add the chicken, keep an eye on it. You want it to stay right around 325F. Cook until the meat is no longer pink and the coating is golden, turning once. It should take about 15-20 minutes, depending on type of meat. Also, check the temperature of the meat: breasts should be 170F and thighs and drumsticks should be 180F. Drain chicken on a rack over a sheet pan. Don't drain by setting chicken directly on paper towels or brown paper bags, it won't stay as crispy that way. And enjoy! One of my favorite pumpkin desserts is pumpkin bars with cream cheese frosting...it's been a while since I've had them, so I set out to make my own version of them...these ones even have chocolate chips. Mix together the pumpkin, eggs, sugar, and oil. 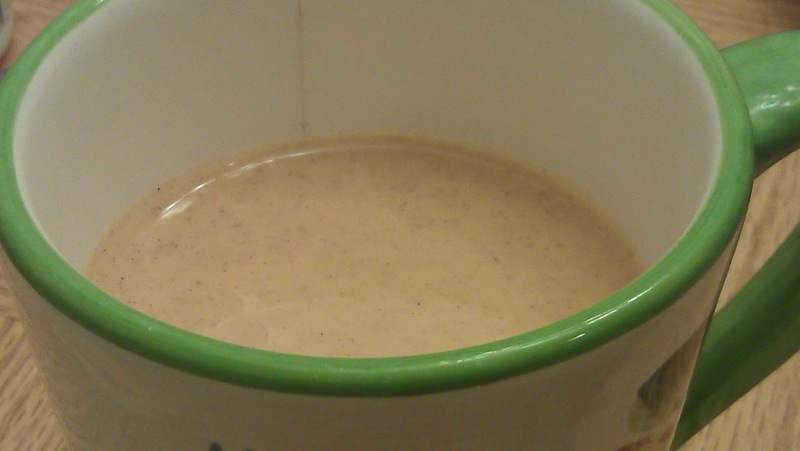 Mix together shortening, yogurt, and vanilla. Add in powdered sugar 1 cup at a time until desired consistency is reached. 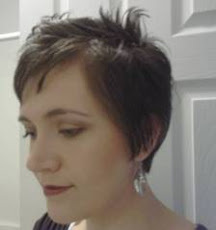 This post is featured on Slightly Indulgent Tuesday and Gluten Free Wednesday, and Allergy Friendly Friday. family that likes pumpkin pie, but I wanted to make sure I could make a dairy-free/soy-free pie before Thanksgiving, so that we'd be set when we get together with my family. 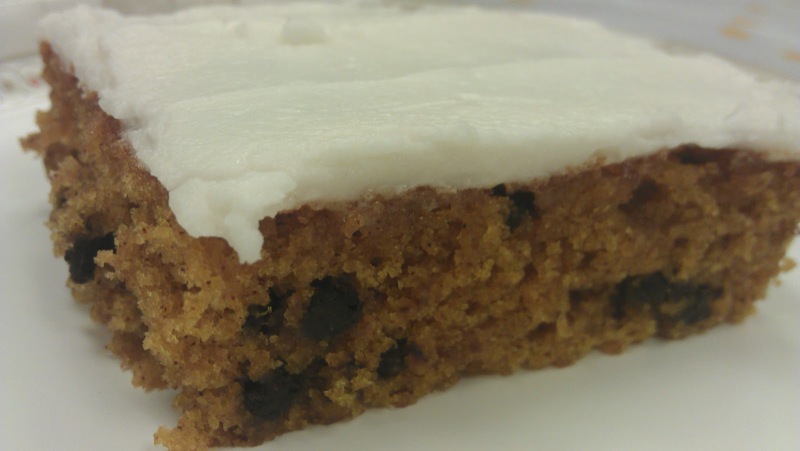 This recipe is based off of Libby's recipe that is on the back of their canned pumpkin. Preheat oven to 425° F. Mix sugar, pumpkin pie spice, and salt in a small bowl. Beat eggs in a large mixing bowl. Stir the pumpkin and sugar-spice mixture into the eggs. Gradually stir in the coconut creamer. Cover the crust with foil, to prevent over browning. Bake at 425° F for 15 minutes. Reduce temperature to 350° F and bake for ~50 minutes or until knife inserted near center comes out clean. Cool on wire rack for 2 hours. Serve immediately or refrigerate. Top with non dairy whipped cream before serving. The post is featured on Gluten Free Wednesday. My husband's favorite pies are razzleberry, apple, and banana cream. I think, actually, those are the only types of pies I've ever seen him eat. I've successfully have made both the razzleberry and apple pies since our diet change, so it was only time before a gave a try to the banana cream. I should have done it sooner. 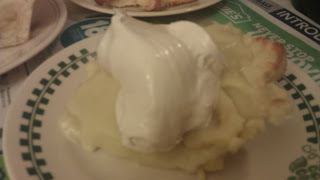 The pie lasted all of a day, so amazingly good and just like an old fashioned banana cream pie. 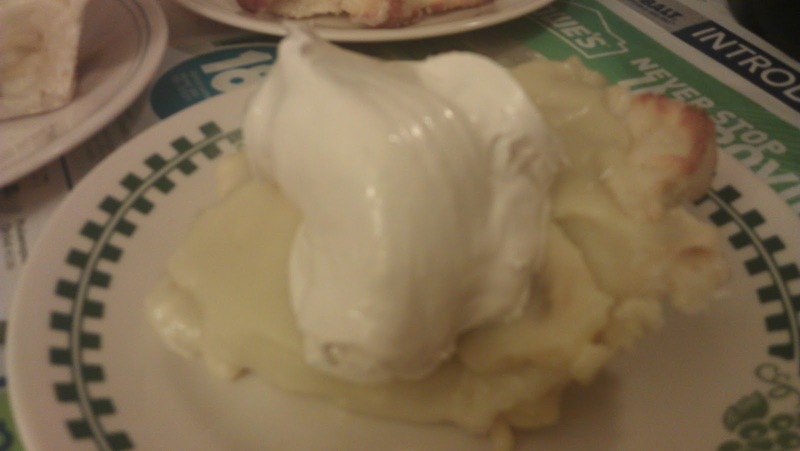 We even had 'whipped cream' to go on top. 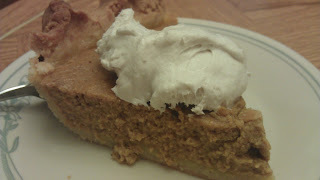 I discovered Mimic Cream Healthy Top Non-Dairy Whippable Cream, which uses cashew and almond cream--so incredibly good, it made the perfect topping to a pure comfort food dessert. One container makes about 4 cups of whipped cream, the nice thing, though is that you can freeze what you don't use. In a saucepan, scald the milk. In another saucepan, combine the sugar flour and salt. Gradually whisk in the scalded milk. Remove from heat and add in the margarine and vanilla. Let the mixture sit until lukewarm. When the mixture has cooled, slice bananas and scatter two-thirds of them in the pie shell, and the other third to the warm mixture. Pour the mixture over the bananas in the pie shell. Allow to chill in the fridge before serving with your non-dairy whipped cream. School Lunch: No School! Fall Break, he'll be eating lunch at the sitter's. No School! Fall Break, he'll be eating lunch at the sitter's.. 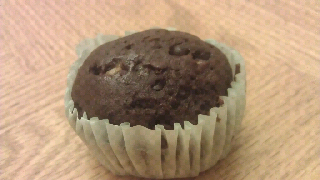 I have been meaning to make chocolate muffins for a long time, since my little one is obsessed with the Udi's Chocolate Muffins, but never have gotten around to it. Tonight changed that. I have a counter full of bananas that needed to be used up, and as I was getting ready to make some banana chocolate chip muffins, it occurred to me to make it a chocolate batter instead...holy cow they are good! Also, I was out of eggs, so these ones are egg-free, too! Preheat oven to 400F. Line muffin tins with paper cups and set aside. In a mixing bowl combine the flour blend, sugar, cocoa, baking powder, and salt. While mixer is running add in the wet ingredients through the canola oil. Stir in mashed banana and chocolate chips by hand. Using a 1/4 cup scoop, spoon batter into each of the prepared muffin cups. Bake for 18-20 minutes, or until a toothpick inserted in the middle comes out clean. Immediately remove from muffin tins and cool on wire cooling rack. No School, so both of my boys will eat lunch at the sitter's. 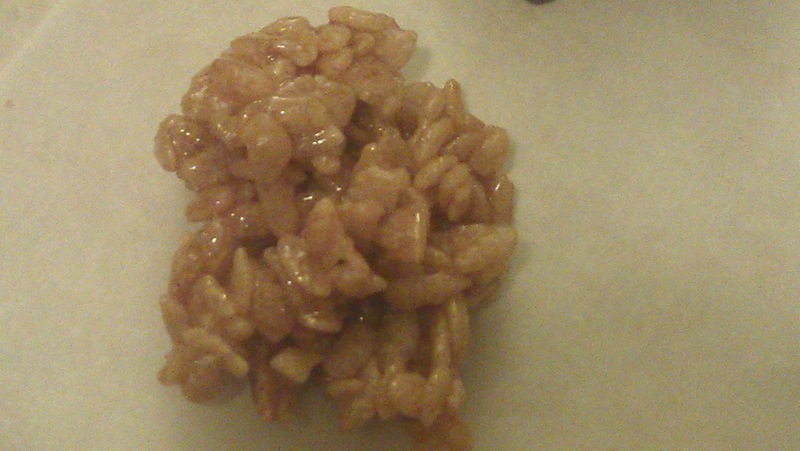 Okay, I've been doing a bit of experimenting with the Erewhon Crispy Brown Rice cereal, mainly because they are having recipe contests for the next three months. This recipe I'm going to enter into December's contest. 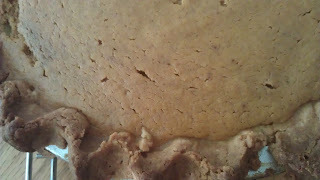 This is the only cookie I've ever had that is actually better once it's cooled. When it's hot the cereal is kind of chewy, but once it's cooled the cereal crisps back up and the texture it gives the cookie is amazing, these are now one of my favorite cookies. Preheat oven to 350F. Cream sugar and margarine until light and fluffy. Add in egg and vanilla and mix well. In a separate bowl, combine flour blend, baking soda, and salt. Add the flour mixture to the creamed mixture and blend well. 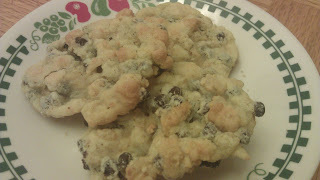 Stir in the crispy rice cereal and the chocolate chips with a wooden spoon. Drop by spoonfuls onto an ungreased cookie sheet and bake at 350F for 10-12 minutes. Remove from the cookie sheet and cool completely before eating. Attune Foods is currently doing a contest for treats using Erewhon Rice Twice, Erewhon Cocoa Crispy Brown Rice, or Erewhon Crispy Brown Rice- GF cereals. So, I decided I needed to play around a little this weekend and try something new with our cereal. This candy is a lot like caramel corn, except it uses cereal instead of popcorn and maple syrup instead of caramel. Boil the syrup over medium heat until it reaches the soft ball stage (234F). Remove the syrup from the stove, add in the margarine and mix together well. Stir in the rice cereal and drop by small spoonfuls unto waxed paper. Let cool and harden before dipping in chocolate. 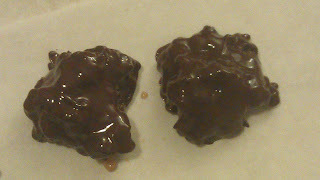 Melt chocolate chips and shortening in a double boiler over hot (not boiling) water. Stir to blend. Lower heat to maintain a warm temperature to dip chocolates. Drop the maple crisps into chocolate and roll to coat completely. Remove with fork to help remove excess chocolate. Place on wax paper to set up. 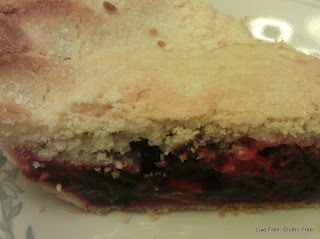 Before our diet change, one of our favorite pies (at least for my hubby and me) was Marie Callender's Razzleberry Pie. Almost every time we went to my Mother-in-law's she would have one for us. And the other day as I was picking raspberries from our bushes, I realized how much I miss that pie...so I made it, and it was amazing! So, enjoy! Preheat oven to 400F. Grease a 9 inch pie tin generously with shortening. In a large bowl, mix fruit, sugar and flour together. 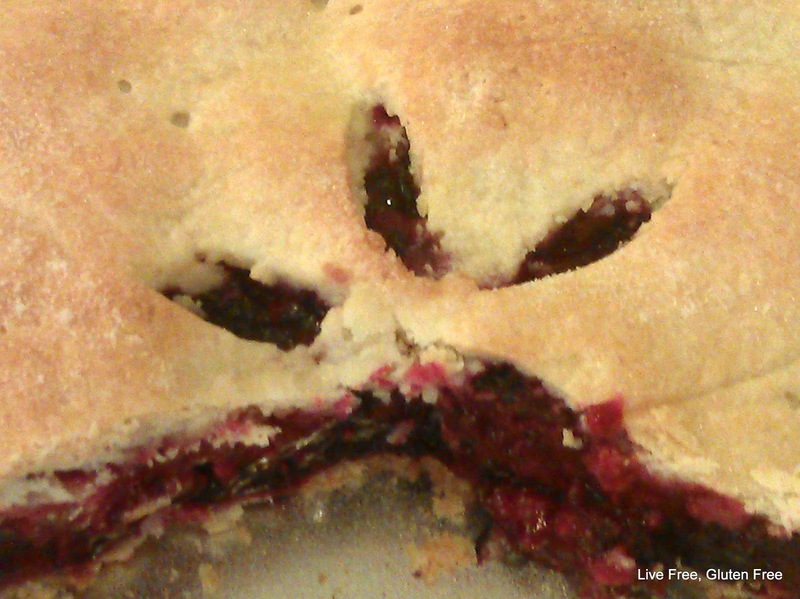 Prepare pie crust as outlined below and fill with fruit. 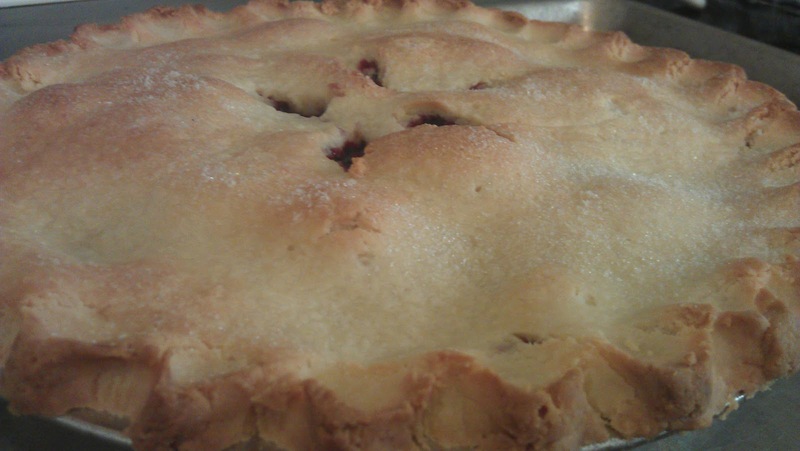 Top with second crust, in the same way, using parchment paper and flipping the crust over the pie. Flute or crimp the edges together, sealing the top and bottom layers. Lightly brush the top crust with water and sprinkle sugar on top. Cover the edges with aluminum foil. Bake at 400F for 30 minutes. Remove the foil and bake an additional 10 minutes or until the crust is golden brown. In a stand mixer, mix together the flour, sugar and salt. Add in the coconut oil and mix on medium speed until the mixture resembles a course meal. Add in the eggs and lemon juice and mix until combined. It should be able to form a nice ball at this point, if it seems crumbly at all, add some water, one tablespoon at a time. Split the dough in half and place each half onto a sheet of parchment paper. Mold each half into a ball, flatten into a disk, pinching the edges together, and top with another piece of parchment paper. Roll out to 1/4 inch thick and about 2 inches larger than your pie tin. Grease the pie tin generously with shortening. Remove the top sheet of parchment paper, flip the crust into the tin, pressing down with the palm of your hand. Press around the edges to make sure the crust is totally in place and remove the parchment paper. 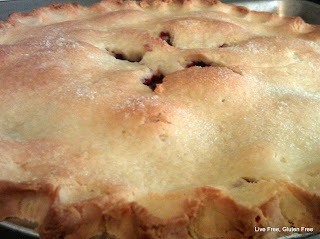 Patch any torn sections as necessary--this is a very forgiving crust. To add the top crust, repeat the preparation on rolling it out between layers of parchment paper and flip it onto the pie. Pinch the two layers together and trim and flute the edges to seal the pie together. 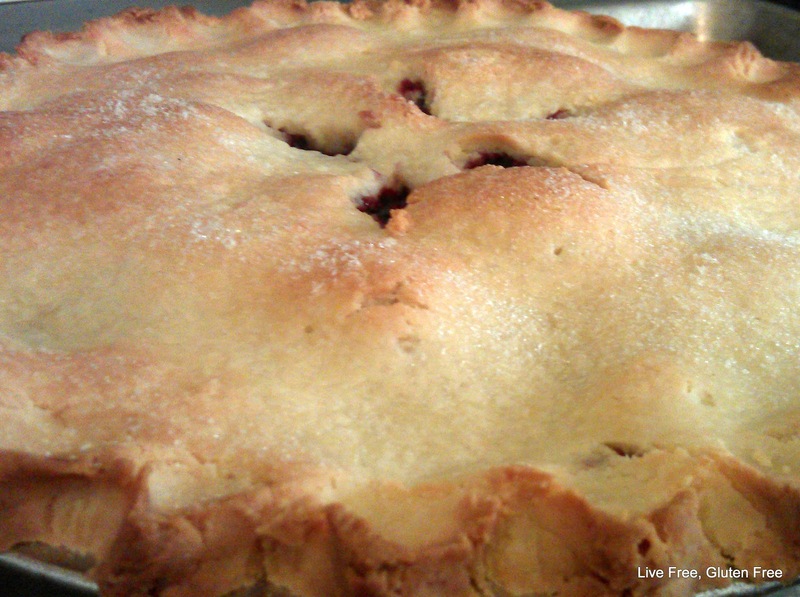 Depending on the size of pie you are making, you may have leftover pie crust. This will freeze, and you can thaw it for use later. Dinner: My older son's friend is very ill in the hospital, he had heart surgery and is not recovering very well from it, so we are going to a benefit dinner that night at Chili's, I've already talked to the manager about the diet restrictions, especially about the soy issues with my little one, so hopefully everyone will be able to eat.